Oiling hair has “a multi-dimensional effect on hair as it increases the strength, prevent breakage, and remove frizziness. Using essential oil not only help to stimulates the circulation of blood to the scalp but also bring the nutrients to the scalp. Today we are forgetting to take care of hair, which is the most important part of our lives and we not maintaining due to a busy schedule. As every like the voluminous hair which boosts the personality and highlights your pampering nature. The essential oils can serve as an alternative to many chemically-infused, lab-manufactured products. So, if you’re looking for something that’s effective, approachable, and completely natural then essential oils really are the best solution. Certain essential oils such as peppermint, rosemary or eucalyptus provide a pleasant tingling sensation. This sensation invigorates the hair follicles, which fosters new hair growth and promotes existing hair growth. Essential oils such as lavender, chamomile, and the likes are known to have relaxing properties that can help put you to sleep and get a good night’s rest help to reduce the level of stress. These oils contain therapeutic properties that are excellent options for treating insomnia and improve your quality of sleep to a great extent. Essential oils are highly concentrated essences of plants. When applied topically, essential oils penetrate deep into the hair follicles and into the bloodstream, thereby deeply nourishing them and aiding in hair growth. Environmental Hair Loss, including pollution, sunlight, seawater, and chlorine can dry out a person’s hair shafts. So applying essential oil to their hair can protect it from some of the effects of environmental damage. Before swimming in the sea or sunbathing, they can coat their hair. Essential oils for scalp treatment are beneficial for their natural cleansing properties. Often recognized as the top essential oil for scalp health is tea tree essential oil, which studies have shown can help naturally treat lice. Eucalyptus essential oil can also be used to relieve a dry scalp. Add a few drops of eucalyptus essential oil into your regular shampoo. Massage the blend onto your scalp and let sit for 1-2 minutes. Rinse out, then follow with a conditioner for a moisturized scalp. There are various reasons behind hair loss such as emotional or physical stress, anemia, changes in hormones, radiation therapy, certain autoimmune conditions, infections, certain hairstyles, or simply a cause of aging. Using essential oils like rosemary and cedarwood are often used in case of hair loss. Any person can use few drops in shampoo or conditioner. One important benefit of essential oils for hair growth is they increase blood circulation in the scalp, thereby ensuring each and every hair follicle is supplied with nutrient-rich blood. This is necessary for strong & nourished hair follicles that can hold the hair strand hence preventing easy breakage and hair fall. Inflammation is one of the root causes of women hair loss and men. Scalp inflammation or folliculitis weakens and damages the hair follicles thereby inhibiting the growth of healthy hair. Many essential oils have powerful anti-inflammatory properties that reduce inflammation and soothe scalp irritation. When essential oils of chamomile, tea tree or lavender are diluted in fatty acid rich oils such as coconut, olive, emu or avocado and applied nightly as an overnight treatment, you can easily treat hair loss related to scalp inflammation. 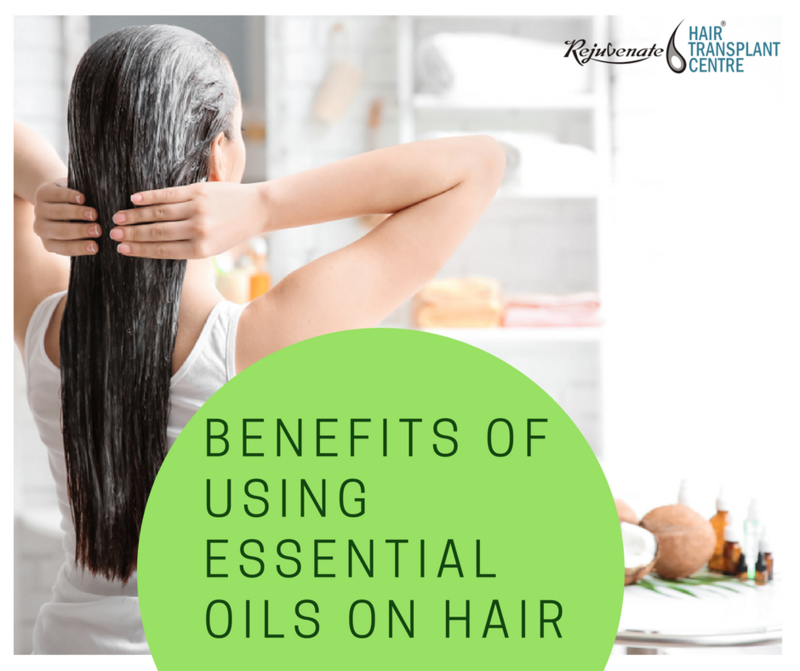 Another one of the benefits of essential oils for hair growth is their strong antiseptic, anti-fungal, anti-bacterial and anti-microbial properties that fight off and kill germs that cause hair loss and prevent hair growth by damaging the hair follicles. By eradicating scalp-irritating microbes, essential oils facilitate healthy hair growth. Essential oils are rich in powerful antioxidants that stave off free radicals. Free radicals cause a host of hair problems including hair loss and premature graying of hair by stealing oxygen from healthy cells. This leads to degeneration of hair cells, making them lifeless which weakens the hair causing shedding. The rich content of antioxidants in essential oils not only combat hair loss & premature graying but also contribute to hair growth.